Benjamin arrives with his parents for a tour of Roaring Orchards, a therapeutic boarding school tucked away in upstate New York. Suddenly, his parents are gone and Benjamin learns that he is there to stay. Sixteen years old, a two-time failed suicide, Benjamin must navigate his way through a new world of morning meds, popped privileges, candor meetings and cartoon brunches—all run by adults who themselves have yet to really come of age. The only person who comprehends the school's many rules and rituals is Aubrey, the founder and headmaster. Fragile, brilliant, and prone to rage, he is as likely to use his authority to reward students as to punish them. But when Aubrey falls ill, life at the school begins to unravel. Benjamin has no one to rely on but the other students, especially Tidbit, an intriguing but untrustworthy girl with a "self-afflicting personality." More and more, Benjamin thinks about running away from Roaring Orchards—but he feels an equal need to know just what it is he would be leaving behind. Dan Josefson has received a Whiting Award, a Fulbright research grant and a Schaeffer Award from the International Institute of Modern Letters. He has an MFA from the University of Nevada, Las Vegas. He lives in Brooklyn, and works at a book club for children's literature. "Dan Josefson is a writer of astounding promise and That's Not a Feeling is a bold, funny, mordant, and deeply intelligent debut." 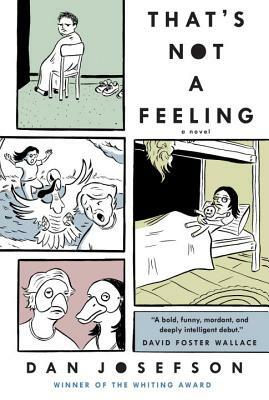 "If That's Not a Feeling were a fifth novel, it would be a triumph. As a first novel, it is an astonishment. Dan Josefson sails along the scary edge of perfection in this book, and does so with style, empathy, compassion, humor, and wisdom." "This is a book of enormous intelligence, and even more heart." —School Library Journal, "Adult Books for Teens"